Animal Ark is built on the principles of family and teamwork. As such, our founders and team members may have manager-type titles, but we all spend a great deal of time on the facility cleaning bathrooms, leading education programs, weeding, and cleaning up behind animals. Are you interested in joining the Animal Ark team? Click the link at the bottom of the page to learn more or e-mail Diana. 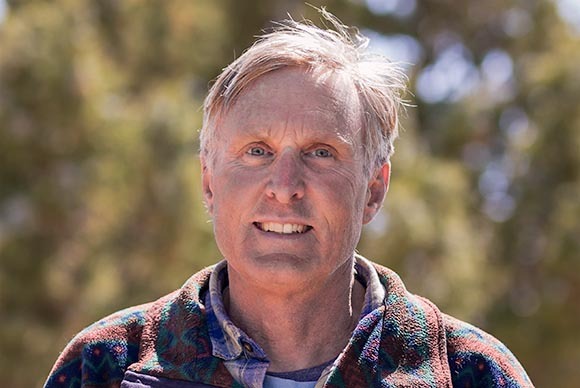 Aaron, a native Nevadan, having founded Animal Ark with his wife, Diana, has served as President from 1985 to 1996 and again from 2001 to 2005, and has been Executive Director since 2005. As Executive Director, Aaron is the primary spokesperson for the organization, leads major fund development efforts, communicates with governance boards, and is responsible for the overall management of the organization. Aaron has been responsible for the design and construction of the Animal Ark facility since its inception in 1981. During Animal Ark’s early years, Diana was responsible for nearly all of the duties at the sanctuary. As a trustee, she served from 1985 to 2012 including 23 years as secretary. At the core of what Animal Ark is today, was a beginning foundation of quality care for wildlife, and an inspiring education program for children. As Programs Manager, she oversees the animal care, education programs, and gift shop. She strongly believes that the many people involved with the sanctuary make it the dynamic place that it is. She sincerely appreciates the talent and commitment of her husband Aaron and assistance from their daughter Roxanne. Jan was introduced to Animal Ark through another volunteer in 1996. At Animal Ark, this marine’s wife became the voice for the native wildlife. She has a passion for providing accurate information so that persecuted species, such as wolves and coyotes, can be better understood and treated more humanely. Rachel learned about Animal Ark from a classmate while pursuing a bachelors in Wildlife Ecology and Conservation at UNR. Having traveled to Uganda with Operation Crossroads Africa and Ecuador for wildlife population counts, Rachel began volunteering with Animal Ark in 2005 and has become an integral part of our team. She has a loving husband and two adorable children. Renee, a Reno native with a bachelors in Spanish from UNR, started volunteering in 2011. She loves the opportunity to work outside and around wildlife. Her passion for animals and dedication are valuable assets to our wildlife sanctuary. This passion is evident in her rescue and care of Charlie the Chihuahua. A northern Nevada native, Nicole has always loved and wanted to work with animals. Moreover, she was excited by the thought of helping non-releasable wildlife. Now, Nicole loves being a team member at Animal Ark! Further, her bachelors degree in Social Work serves her well as she interacts with Animal Ark’s guests. Nicole is also a kind and caring mother. Theresa grew up in rural Nevada where she developed an appreciation and love for wildlife. Even though she was very shy, she became a volunteer docent at the Animal Ark at age 15. She went on to earn a degree in Captive Wildlife Care and Education from Unity College, a small college is Maine. After graduation she returned to the Ark in 2014 as an animal keeper. Her hobbies include hiking and camping. Tim retired in 2016 after a thirty-year career with the BLM and Forest Service as a wlddland firefighter. He felt he still wanted to be part of a team so he began volunteering at Animal Ark in June of 2016. In 2017, he joined the staff working in facilities maintenance and also became trained as an animal keeper. Tim’s enthusiasm and love for the animals keeps him motivated. Susan starting volunteering at Animal Ark in 2011 after visiting as part of a photo outing and is now part of the staff. She is in her second career after 30 years in the aerospace industry as an engineer and flight instructor. At Animal Ark she has the opportunity to indulge both of her passions – animals and photography. Marvin started volunteering at Animal Ark in 1999, and became a full time employee in 2015. Marv’s passion is at-risk youth; he is the Pastor of Children and Youth Ministries at A Voice in the Wilderness Church in Reno, and co-founded Sierra Nevada Teen Ranch to provide opportunities and services to Nevada’s at-risk youth. Marv is a Licensed Social Worker (LSW); he received his Bachelor’s degree from UNR in 2014, and has an Associate Degree in Business Mid-Management from TMCC. Candace has worked with exotic wildlife since 1992 and joined Animal Ark’s team in 2002. She began volunteering at Animal Ark to fill a need and truly fell in love with our organization. This mother and grandmother bring a vast array of experiences to our animal care team, having served in the Air Force and as a forest firefighter. Linda started volunteering with Animal Ark when we first opened to the general public in April of 1994! She started as an Admissions Attendant and has helped with education and animal care. After retiring from a career in accounting, Linda began to travel the world, including many of the U. S. scenic sights, China, and Africa. As a supporter of many wildlife conservation organizations, Linda is always looking to support wildlife and Animal Ark. Marion is originally from Germany and came to the United States when she won a green card in the lottery. She came to Reno looking for the perfect place to live. She is retired from the computer industry and now enjoys traveling all over the world and skiing. She loves Animal Ark because she loves cats, especially the wild, stray, and independent farm cats. Latricia grew up in Wyoming and attended the University of Iowa in Dubuque where she majored in Environmental Science and English. She worked for the Endangered Wolf Center in the St. Louis, Missouri area for a short time as an Animal Keeper. It was here that she saw species on the brink of extinction and where she developed her love for wildlife and desire to help in any way possible. After moving to Reno in the early 2000’s she heard about the Animal Ark and began volunteering in 2004. She helps coordinate special events at the Ark and assists behind the scenes with whatever projects she can while working full time for the Washoe County Health Department. Holly grew up in Reno but went out of state for her undergraduate education and returned to Reno to attend UNR for her doctorate. She first came to Animal Ark in 2009 to attend the annual Out of Africa event. A former Spanish and history teacher, she started volunteering to help with the school field trips and the fundraising event committee. Currently she specializes in rounding up silent and live auction items for the annual September event, now called Paws and Claws. Her personal passion is cats — from the biggest mountain lion and the playful bobcats at the Ark to her mischievous Burmese kitties at home. Nancy started volunteering at the Animal Ark in early 2010, working behind the scenes to help others who were coordinating events, donations and publicity. She now also serves as an animal keeper and educator. She has college degrees in psychology and animal behavior, and spent 25 years as an administrator at Stanford University. When not at the Ark, Nancy and her husband, Tim, travel the globe to find and enjoy wild animals in wild places. Irene is a retired Human Resources specialist who has worked for several large companies including Amazon. After she retired in 2011, she began volunteering at Animal Ark which had been on her “bucket list” for years. She loves the kids, being a docent, and also organizing a lot of things that the ark needs. For the past two years, Irene has been a major organizer of the Paws and Claws event and contributed greatly to the success of this event, which is the major fundraising event for Animal Ark. Heidi has been a volunteer at Animal Ark since 2000. She is a native Nevadan and moved to the Reno area in 1998. She currently works for the UNR College of Science Dean’s Office as a Grants and Projects Analyst. She has Bachelor’s and Master’s degrees from Nevada universities. Heidi believes that it is our responsibility to be guardians of animals and to be their voice and advocate, and has been involved with animal welfare her entire life. Jessica was born and raised in Reno, NV and graduated with a Bachelor Degree in Biological Sciences from California State University, Sacramento with a focus on marine life and fisheries. Her love for Reno and for four legged furry creatures got the better of her and she returned to Reno. She began volunteering at Animal Ark 10 years ago, and is very involved in the Animal Ark Stampede. She loves education and teaching young children to love and respect wildlife to build a better future for our planet. She enjoys spending time with her husband and 12 year old son, Scott, who has been accompanying her to the Animal Ark on school breaks for the last 5 years, giving tours and setting up education tables. Michele has been at Animal Ark for over nine years as a volunteer. She worked as a special education teacher in the Bay Area and commuted up to Reno every month to volunteer. She has now moved to Sparks and is working as a special education teacher in Reno, so now she spends at least a couple of days per week at the Ark. Kathy began volunteering at Animal Ark in July 2015. She is originally from New Jersey. During her 32 year career with the Federal Government she lived in northern Virginia and also served overseas in Hong Kong, France & Switzerland. After retirement, she moved to Reno, Nevada to be close to her favorite interests–skiing, snowshoeing and hiking. 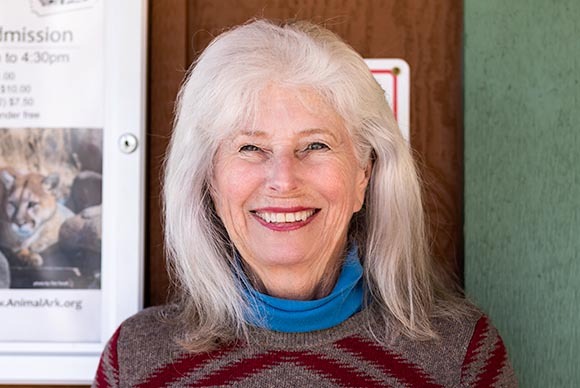 After arriving in Reno, Kathy served three years as Secretary for the Tahoe Rim Trail Board of Directors. She & her husband Bill also enjoy traveling. She enjoys being outside & loves animals. After visiting Animal Ark, she thought it would be the perfect volunteer job. Animal Ark is always looking for volunteers! Do you love animals, the outdoors and interested in becoming a volunteer?